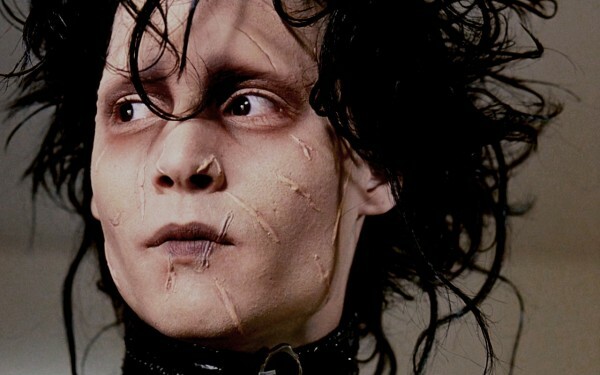 Edward Scissorhands: What is it like to be "different" and how does society treat difference? My seventh feature for Vada Magazine was about Edward Scissorhands, a film about an individual (Edward) who is different. The film explores the joy and pain of being "different" and considers how society embraces and rejects difference. Edward Scissorhands is an original story – a dark, gothic fairytale/fantasy – from the imagination of Tim Burton, who also directed the film. Edward is an artificial man who has scissors for hands (hence “Edward Scissorhands”) because his Inventor died before he could finish him. The film explores what happens when Avon lady and kind neighbour, Peg, discovers Edward living on his own and decides to take him in as part of her family. Her one act of kindness has far-reaching consequences for Edward, her family and the local community. I saw Edward Scissorhands when it was first released in 1990 and the film made a profound impression on me. It remains one of my favourite films to this day. It is a film about an individual (Edward) who is different, and the film examines how society responds to that individual and his difference. I have always felt a real empathy and a connection with Edward. The film, and Edward himself, moved me and broke my heart. As Edward is created and given life by his Inventor, there are clear echoes of Frankenstein. However, a key difference is that Edward’s Inventor has every intention of nurturing Edward and teaching him the ways of the world, unlike Victor Frankenstein who abandons his Creature in horror. Unfortunately for Edward, his Inventor dies before he can complete him and his education, and Edward grows up orphaned and alone in a Castle at the top of the hill. Edward’s life changes the day Avon lady, Peg, comes calling, decides to take him in as part of her family and introduces him to the local community. One of the most heart-warming sequences is when Peg first brings Edward down from the Castle into the local neighbourhood. You see Edward smile because he is happy that he will finally have a home and a family, and you also see the wonder in his eyes as he observes all the local people going about their daily lives. I think Suburbia is portrayed very powerfully and effectively in the film. You are shown the conformity and the uniformity of modern suburban lives. You are shown the fact that it is a very close-knit community, with everyone knowing everyone else and everyone else’s business. You are shown how quickly small-town gossip spreads through phonecalls. I got a very clear sense that any form of individuality would be suppressed and suffocated in this community. The film follows a familiar story arc – the rise and fall of Edward. When Edward first arrives, everyone is keen to meet him and they welcome the new arrival. The neighbours embrace and celebrate the special talents Edward has in topiary, as a dog groomer, and as a hairdresser, because of his scissorhands, and his services are in high demand. He is even feted on a TV talk show, becoming a local celebrity. However, although Edward becomes famous because of his scissorhands, in his heart of hearts he just wants to be “normal” – the same as everyone else. Before long, however, things start to go wrong and Edward’s new idyllic family life starts to come apart at the seams. He has fallen in love with Peg’s daughter, Kim, and gets involved in a burglary because she asks him to. Edward gets caught and has to face the consequences. You can see the humiliation that he feels and the sense that he has let Peg and her family down by repaying her kindness and hospitality with his wrongdoing. The family, and the wider community, blame Edward, believing he has no sense of right or wrong. They start to think the worst of him and begin to turn against him. After this, Edward is blamed for everything that goes wrong and the worst possible interpretation is put on his actions. Peg realizes that what she thought was an act of kindness – bringing Edward down from the Castle and into her family and her community – may have been the wrong thing to do. After an eventful night, Edward is forced to flee the neighbourhood, leaving a trail of destruction in his wake. He vandalizes goods and property, including many of his own creations, because he has been rejected and hounded out of society, and he is hurting inside. Crowds gather outside the Castle baying for blood, but Kim saves Edward by telling them he is dead. Satisfied, the crowds disperse and leave. Edward returns to his former solitary life. Johnny Depp’s (Edward Scissorhands) performance in the film has to be seen to be believed. He has just the right mix of innocence, vulnerability and fragility, and you can sense and feel the kindly soul behind the razor sharp scissorhands. Winona Ryder (Kim), Dianne Wiest (Peg), and Vincent Price (the Inventor) all give stand-out performances in the film. I also have to give a special mention to Danny Elfman’s soundtrack for the film which is enchanting and magical. It adds real beauty to the piece and makes it special, just like Edward. I think Edward Scissorhands can teach us a lot about the way we as a community/society respond to, and treat, people who are different. I look forward to the day when we make everyone, regardless of their difference, and whatever the nature of their difference, feel welcome and loved in our community/society. We should not reject difference; we should learn to embrace, respect, value and celebrate difference. The Edwards of this world are very special. Edward Scissorhands is available to rent or buy on DVD.